A shade-house can be used for many purposes. We built two of ours specifically for wicking beds. The lay-out aims to get the maximum growing area in the shadehouse. In this lay-out the total growing area is 18.5 m2. 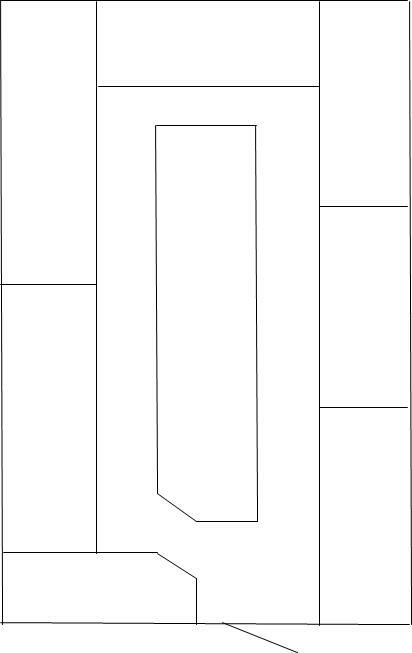 The floor plan is not to scale but the beds around the perimeter are 90 cm wide. The bed in the middle is 1.1m wide. The paths between the beds are 55 cm wide, just wide enough for a narrow wheelbarrow. The path near the end is 30 cm wide, just wide enough to walk through. The corners of the beds near the door are cut diagonally to allow wheelbarrow access. Our earlier designs had single beds along the full length of the sides. We found them hard to manage, especially when filling the reservoirs or when replanting parts of a bed. We now mainly use beds of about 2 to 2.5 metres long. They work well and give much better flexibilty when planting. Only the bed in the centre is 3.4m long. We put 13 mm poly-pipe pipe around the perimeter. We connected this to the fill pipe of each bed through a T-piece and a short length of polypipe. Each bed has its own 13 mm poly-tap to turn water on or off so we can water each bed to its own needs. The poly-pipe is connected to a 1000 litre tank which is filled from a dam. We can mix liquid organic fertiliser in with it. We water by gravity from that tank. We placed 100x100 wire-mesh at some ends as well as in an inside arc just below shade clot. 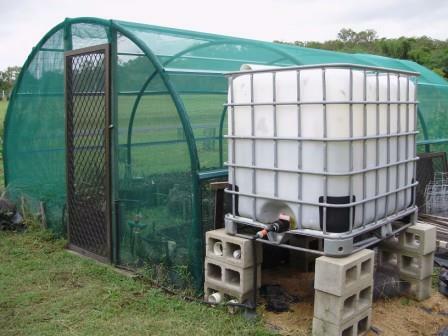 These provide frames for climbing crops such as peas, tomatoes and cucumbers.